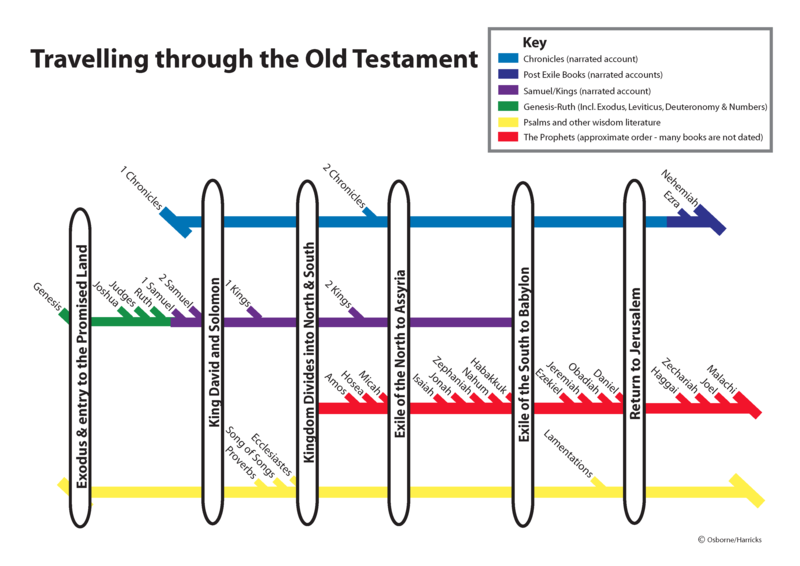 A timeline showing how the Old Testament fits together, showing key moments in history and different lines for each genre. By Tom Harricks. PDF version (29 KB). This entry was posted in English and tagged Old Testament, timeline. Bookmark the permalink. Why isn’t Job or Esther on here? I love this! …& the entire site, for that matter! I just came across Visual Unit about 3 wks ago & am so very impressed & am benefiting greatly from it all! 🙂 THANK YOU! Have you considered rotating this 90 degrees to the right, making it a portrait & then flipping the names of the books 180 degrees — that way the viewer doesn’t have to toggle between slanting left to read the key moment, then slant right to read the book names. I may be a visual wimp, but thought it might be worth sharing. Also, tell me you are familiar w/ Edward Tufte’s work? Thanks again!! But I mis some wisdom books (Job and Ester). Thank you so much! A lot of your charts are great for teaching people how the Bible flows. Really appreciate it! Great diagram! What about Psalms?